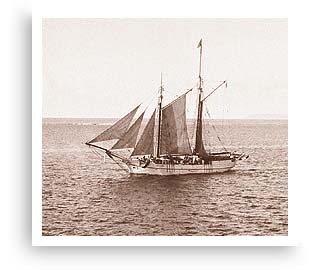 In 1932, while a student at George Washington University, he organized an expedition to the Caribbean aboard the Doris Hamlin, a 200-foot four-masted schooner. This vessel was the platform for the most exciting adventures many of his fellow students ever had, wrestling billowing sails to drive the big schooner first from the Chesapeake to Bermuda, the south into the Lesser Antilles and the Caribbean. And during these long days at sea, Ron drew upon his experiences in the South Pacific to teach his fellow students how to navigate and make noon sights of the sun to determine their position on the wide ocean. Six years later, Ron returned once again to the sea, this time in the waters of Puget Sound, aboard the Toughey, a twenty-eight-foot wooden sailing yacht. The Toughey was followed by the Magician--the thirty-two-foot sloop he sailed along the tortuous watercourses of British Columbia and Alaska under the flag of the Explorers Club. And it was on this voyage that some of his most important contributions to the world of yachting were made. With the onset of World War II, he was chosen to command several subchasers in both the Atlantic and Pacific theaters, where he distinguished himself as an officer who cared more for the safety of his ship and men than for gilded braid. Aboard the USS Algol in the Pacific, as chief navigator he wrote a textbook for his crew, not only greatly simplifying the technology of navigation and its terms, but making navigators out of men who would have otherwise floundered. At wars end, and often during his lifetime, Ron continued to brave Old Man Sea--and continued to pass along the knowledge he gained to others. 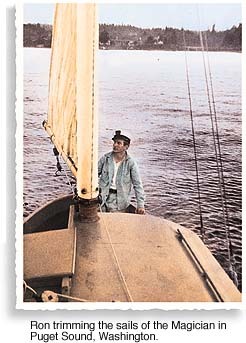 Whether upon Chesapeake Bay, crossing the Gulf Stream from Miami, or sailing the waters of the Mediterranean and the Caribbean, he continued to write about and enrich the field. In this issue of RON, you will not only follow his passage to proficiency as a skilled yachtsman, but learn of his many contributions to the field that have assisted so many thousands of mariners. Now, with a fresh wind rising and the sea beckoning, its time to bend on the mainsail, hoist anchor and begin our first venture.